BACKWOODS brand BBQ wood pellets are 100% natural with absolutely no additives. The natural wood is densified giving more heat and flavor for its volume. BACKWOODS is the fuel of choice for your Louisiana Grill wood pellet bbq, and as well can be used in gas, electric or charcoal grills, barbecues or smokers. 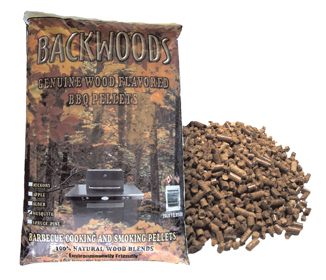 BACKWOODS pellets are clean and convenient, delivered in well-packaged, 20 lb./9 kg bags. They are non-polluting, renewable resource made from waste wood fiber.